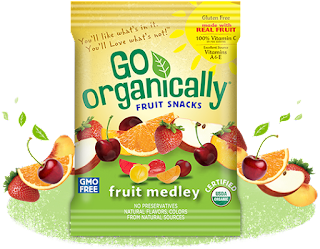 Go Organically Fruit Snacks are a brand of GMO-free fruit snacks available in three varieties, all of which are USDA-certified organic, made with real fruit purées and real fruit juices. These treats include 100% of the daily recommended value of Vitamin C and are a good source of Vitamins A and E. Go Organically® Fruit Snacks are also gluten-free, preservative-free and made with natural flavors and colors from natural sources. As parents, we know that instilling a love of reading in our kids is one of the most important things we can do. Reading exercises the brain, improves concentration, reduces stress, sparks imagination and even helps develop empathy. Plus, it can become a lifelong habit that provides a whole lot of FUN for your family. So in honor of #NationalBookLoversDay on August 9, Go Organically put together some great tips to help parents inspire the next generation of bookworms. 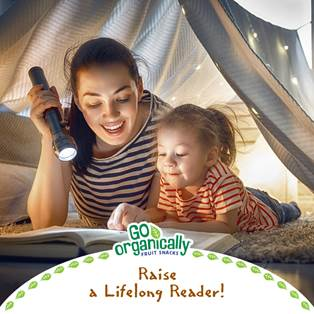 Happy reading from Go Organically Organic Fruit Snacks. Made with real fruit, their gluten-free, nut-free, dairy-free kids snacks are a great accompaniment to your kid’s favorite book. Toss them in their backpack and off they go! Be sure to follow Go Organically on Facebook for more kid-friendly ideas. One person will win two boxes of Go Organically Organic Fruit Snacks (one Fruit Medley and one Mixed Berry). I received no compensation for this post. This post is in partnership with PR firm. Please do your own research before purchasing products or using services. Your opinions and results may differ. One of my favorite books is James and the Giant Peach. I think you meant to ask about flavors in stead of books, I like tropical. I've always loved Tuck Everlasting and read it to my 4th graders every year! I always liked R. L. Stine and V.C. Andrews. I like James Patterson and Dean Koontz for authors. Water for Elephants is one my favorites. I like the Notebook. We like the Fruit Medley flavor of fruit snacks. Fannie Flagg is one of my favorites. I still love Little Women! I read it as a young kid and it has stuck with me. I even like the movie which is weird for me. I usually dont like a movie after I have read the book. When I was young, Dr. Seuss was my favorite and all the books. Older now, I do like Stephen King novels. My favorite author is Sue Grafton and her A to Z mystery series of books. One of our favorite children's authors is Arnold Lobel. I love dr Seuss books! I always loved the Judy Blume books. I love Charlie and the Chocolate Factory as my all-time favorite book and movie. I have been sharing/reading the Many Adventures of Winnie the Pooh to the grand children and they this it is wonderful (sometimes scary) - just like me! I enjoyed Pride and Prejudice quite a bit. I like books by Roald Dahl. My all time favorite book is The Covenant by James Michener. I also love the Harry Potter series. What a world J.K. Rowling built! My favorite author is JK Rowling because my oldest son really loved reading all of the Harry Potter books and I think it made him love reading. I love lots of different authors for different reasons. Nora Roberts is one of my favorites! Dr. Seuss for sure...fav book of all time is Green Eggs and Ham!!! Nightmares and Dreamscapes is my favorite book! Joe Hill is one of my favorite Authors. One of my favorite authors is Nicholas Sparks. I like classics like Alice in Wonderland. A writer named Lani Lynn Vale. I read everything she writes. I've always loved Shel Silverstein books when I was younger. As an adult, I am a Stephen King fan. The Black Stallion author Walter Farley. One of my favorite authors is Ilona Andrews. Harry Potter and the Goblet of Fire is one of my favorite books. One of my favorite authors is Beatrice Small, I still read her books. One of my favorite books is Peter Pan. I just love the story and characters so much. I accidentally took the entry for the tweet. Sorry about that. My favorite book is Pride and Prejudice. I so heart Voltaire's "Candide"! I would love to try the mixed berry. As for authors, I love Anne Tyler. I love any book by Nancy J. Cohen! I have several favorite authors. It just depends on genre. I like to read any of Stephen King's books. A Tale of Two Cities is one of my favorite books. The Harry Potter books are the best! I also love the tropical flavor, thanks! I love suspense books so one of my recent favorites was The Couple Next Door by Shari Lapena. I liked the Fablehaven series. I'm a big fan of Kurt Vonnegut books. I love The Secret Garden!